cheesymash: Butter beans with majoram and tomato aka "Brittany-style beans"
Butter beans with majoram and tomato aka "Brittany-style beans"
Fry the the chopped onion and bacon bits for a few minutes. Add plenty of majoram - don't be shy - and some paprika, perhaps a teaspoon. 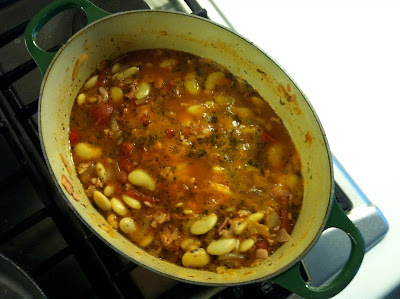 Once they're all glossy, add the tin of chopped tomatoes and the drained butter beans. Cook for a further 20-30min all together. You can eat this with warm crusty bread, or with your dinner as we did. You can see it up there with some mashed potatoes, beetroot and a duck's bottom. I've just realized that I'm probably being weird again - by duck's bottom I mean not the actual bum, just the sort-of-tail-bit at the end of the body, attached, of course by it's very nature, to the bum. Am I the only one? We've recently launched the site Alldishes.co.uk where users can search through hundreds of thousands of recipes from UK and Irish food sites and food blogs.